Nigel Farage has said Donald Trump’s victory in the US Election will bring a wealth of economic benefits to the UK, describing the new president as ‘a true Anglophile’ and an ‘ally to Britain’. 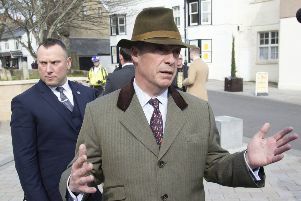 The former UKIP leader said the controversial tycoon’s rise to power was a sign of what a strong electorate could achieve. The MEP for the South East of England had campaigned for Mr Trump in the United States, giving a speech at one of the Republican’s rallies. He likened Mr Trump’s victory to that of the UK’s successful Brexit campaign, during June’s EU referendum vote. Reacting to the billionaire businessman’s presidential win, Mr Farage said: “This is incredible news – 2016 has been the year of phenomenal change. “No one thought Trump could do it – no one thought Brexit could do it – but he has. “This just goes to show the complete political disconnect in the world at the moment. Mr Farage was confident the UK could thrive economically with Mr Trump at the helm. “He wants us to be at the front of the queue in a special relationship between the US and Britain,” Mr Farage added. The Brexit campaigner said he would be flying over to the US to congratulate Mr Trump in person. It comes after the MEP said he would accept a job from Mr Trump if the Republican candidate romped to victory.